"Overlooking the Fateh Sagar Lake, the Lalit Laxmi Vilas Palace amid the Aravallis, is one of the best heritage hotels in Udaipur. The hotel is an epitome of the culture and historical heritage of the royal Rajasthan state. Constructed in 1911 by Maharana Fateh Singh, this property lies on a hilltop and thus offers splendid views. It is located just a few kilometers away from the main city and boasts of wonderful interiors as well as architecture. 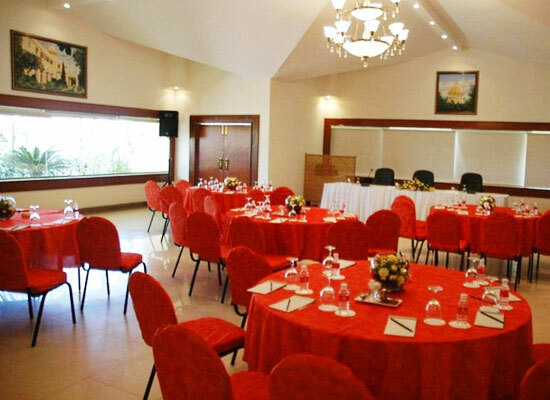 There are 55 spacious and well-equipped rooms and suites. There are 3 dining venue serving the best of delicacies and drinks. The Lalit Laxmi Niwas Palace building was originally built by Maharana Bhupal Singh in 1911, to serve as the residence of Mr. Winn Gate - an eminent political agent of that time. Later, in 1945, Mr. Gate was shifted to another place and Grand Laxmi Vilas Palace was revamped to serve as a royal guest house for dignitaries, visiting princes and British officers. 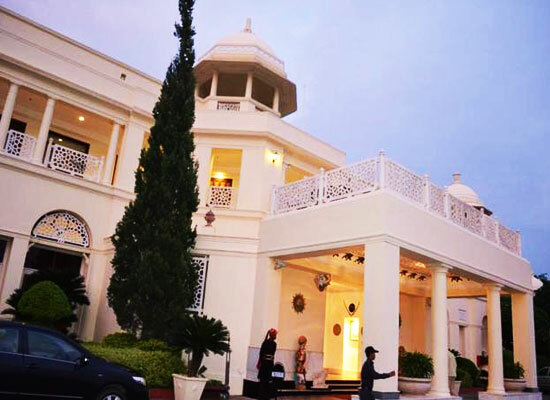 Managed by the Grand Group of Hotels since 2002, Laxmi Vilas Palace Hotel has been meticulously restored, with special emphasis on accommodation options - which finely blends all contemporary luxuries with unique royal splendors. Covering an area of 300 square feet, Deluxe rooms have been decorated with wonderful paintings of Lord Krishna. These rooms offers the views of the lake or the valley. Positioned in the newly renovated wing of the hotel, these rooms are quite capacious. Savor stunning sunrise views. The attached bathroom comes with a shower cubicle and complimentary toiletries. Some of the facilities and amenities offered here are complimentary seasonal fruits, 40-inch LCD TV, DVD player, Wi-Fi access, complimentary newspaper, mini bar, complimentary tea / coffee maker, iron and ironing board, iPod docking station, IDD digital phone and electronic in-room safe. 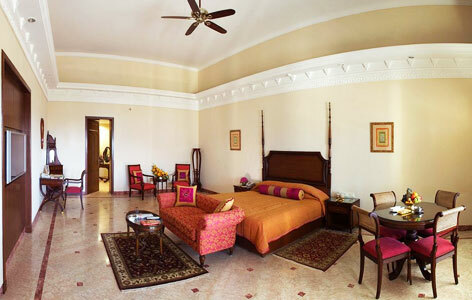 Spread in area of 500 square feet, Palace Suites have sophisticated décor and wonderful artwork. Treat your eyes to the wonderful views of the hotel’s well-maintained gardens or the lake through the large windows. The recently refurbished rooms come with a dining area and a master bedroom that has an attached bathroom. There is an attached balcony too. Enjoy contemporary conveniences like shower cubicle, bathtub and premium complimentary amenities in the bathroom. mini-bar, complimentary newspaper, 42-inches LED TV with DVD player, Wi-Fi facility, butler service (on request), IDD digital phone, electronic safety deposit, complimentary tea / coffee maker, complimentary chocolate platter and fruit basket, iron and ironing board etc. With an area of 800 square feet of living area, Princess Suite comes with a living area, master bedroom and a dining area. From the large windows, enjoy picturesque views of the city or the lake. High ceilings, marble flooring and vintage furniture look quite graceful. Complimentary premium toiletries, shower cubicle and a bathtub are part of the en-suite bathroom. IDD digital phone, complimentary fruits basket and chocolate platter, electronic safe, mini-bar, DVD player, 42 inch LED TV, complimentary newspaper, iPod docking station, Wi-Fi facility access, iron and ironing board, Butler service (on call), complimentary tea / coffee maker are some of the modern amenities and facilities offered to the guests. Sprawled in an area of 800 square feet, Maharani Suite offers royal living to the guests. 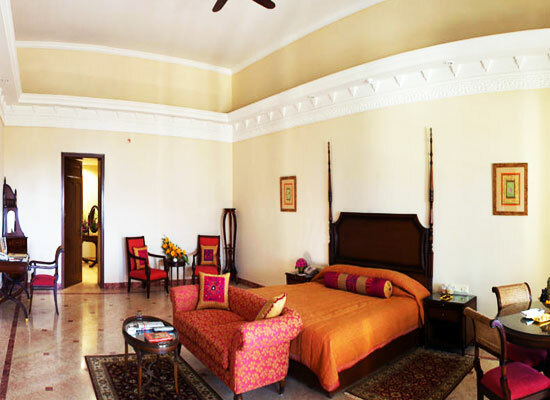 The suite features contemporary amenities and has a sophistical décor that features wonderful with Rajasthani. From the corridor of the suite, treat your eyes to the views of the Fateh Sagar Lake. This suite comes with a dining area, a living room, a capacious master bedroom and a dining area. The suite also offers the view of the courtyard of the Maharana Suite. The attached bathroom has shower cubicle and bathtub. Enjoy the services of a dedicated butler during the stay. Electronic in-room safe, IDD digital phone, iPod docking station (on request), 42-inch LED TV with DVD player, Wi-Fi internet, iron and ironing board (on request), complimentary tea/coffee maker, complimentary chocolate platter and fruit basket, complimentary newspaper, mini bar are some of the conveniences offered here. Covering a huge area of 1200 square feet, the Maharana Suite has a tasteful décor with a royal feel. Relish enormous views of the Fateh Sagar Lake and the Aravalli Hills from this suite that provides complete privacy to the guests. The Maharana courtyard and balcony offers a private space for small gathering or intimate dinners. The huge living room has a dining table with rich upholstery. Hand-painted ‘Tree of Life’, a golden leafwork, adorns the wall. The master bedroom comes with an attached bathroom that has Jacuzzi, shower cubicle and complimentary premium amenities. The suite features a dressing area also. Contemporary world-class comforts make your stay memorable. The list of such amenities and facilities include complimentary newspaper, dedicated butler service, iron and ironing board, IDD digital phone, complimentary chocolate platter and fruit basket, mini bar, complimentary tea / coffee maker, wi-fi internet, iPod docking station and electronic in-room safe etc. The restaurants at the Lalit Laxmi Vilas Palace of Udaipur take you back into 1950s, which were the days of His Highness Maharana Bhupal Singh. Dining experience at this five-star luxury heritage hotel is unforgettable. Traditional recipes and contemporary fares are combined with great ease by the expert chefs. Private dinners can be planned at the Maharana Courtyard. Aangan has a busy open kitchen where the guests can watch the chefs preparing sumptuous delicacies for them. The restaurant has an indoor and an alfresco dining space with views of Sajjan Garh Fort and Fateh Sagar Lake. Traditional Rajasthani folk dance performance is another highlight of this venue. The restaurant serves Indian cuisine, along with a fine collection of cocktails, beer and wine. Specialties are grilled and bar-be-cue, along with a special Shikar (Hunters) Menu (on request). 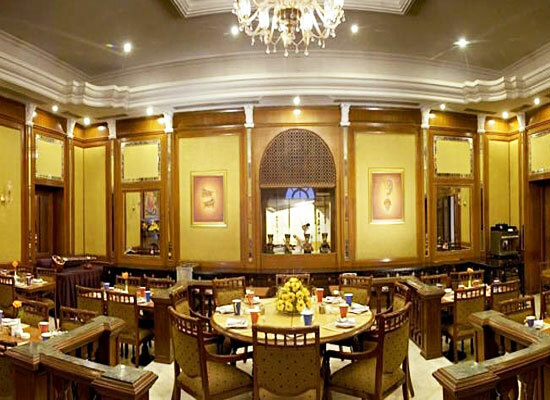 Padmini is a round the clock multi-cuisine restaurant, which has been named after the beautiful, courageous and legendary Rajput queen, Rani Padmini. The exhaustive menu consists of Indian, Rajasthani and a variety of Continental delicacies. Antique artefacts from her times adorn the restaurant’s walls. Guests can savor a royal meal with their loved ones while traditional music plays in the background. The interiors exude a Rajputana charm. Serving Western BBQ delicacies, the chefs at the Garden Grill prepare meals using fresh herbs from the garden, fresh vegetables and juicy meats. Choose your favorite from a variety of select wines. A vision in white seeped in romance and beauty, Udaipur is an exquisite blend of multifarious sights, sounds and experiences - providing many an inspiration to poets, painters and writers. A beautiful city in Rajasthan state of India, Udaipur presents a kaleidoscope of fairy-tale palaces, forts, lakes, temples, gardens, reminiscent of a heroic past strewn with tales of valor and chivalry.